...for us in the Sixty One A household! ...this one is my favourite! The small one of St Ives is available in my shop: the Portscatho picture will be coming with me to Homespun Fair! Speaking of which - I didn't show you a photo of what we came across on the beach a couple of weeks ago - the back end of a boat! We're going to transform it into a garden bench - I'll keep you posted on that one! Another fab acquisiton which we've been storing for about 12 months - a huge cable reel! I originally wanted the whole thing as a table in the boys room, but it was just too big, so Steve's just taken the top for now and put some legs on. Remember the upcycled pallet chairs he made a while back? Well, he's got 3 more to make now! Then hopefully this gorgeous weather will continue and we can start eating outside soon! And finally, all this crafting seems to be rubbing off on the kids! How do you like this rather primitive dog that Buddy knocked together yesterday?! Phew! That seemed like a long post! Have a good week, folks! The boys have spent the weekend with my parents, so Steve and I have been hard at it in the shed - working! (for any of you with smutty minds!) Plenty of driftwood to work with at the moment, I felt a bit spoilt for choice! This is one piece I finished yesterday: I love the bit of wood with blue paint on it, it really suggested a rough sea to me - that's why I decided to hoist the red flag! The 'sea' has real movement I think - partly to do with the uneven shape of the blue paint, and because of the layers and different colours, it suggests seaspray - to me, anyway! I had a few nice small pieces of wood like this one below - I love the shape of it, with that little natural hole in the corner. Because of their size, I was able to use long nails instead of sticks as the masts. These tie in nicely with the rusty washers I think. It's been a while since I did any of these sculptures with the bunting above, but I couldn't resist! It would brighten up any room and is available in my Folksy shop. It's that time of year again folks! I will be donating ALL money from tomorrow's sales in all my shops (Folksy, Etsy, my website and Noths) to Comic Relief. Please spread the word! I don't know why I chose to do another collage of St Ives when there are so many beautiful places to choose from around here! Perhaps it's because there's a gallery there that want some collages of mine, so it's back-up if I don't manage to sell it myself! Or perhaps it's one of my favourite places in the whole world! The piece is about 22cm wide by 15cm high - and it took me less than a day. I feel like I've been pretty prolific this week! I've really enjoyed it. But now, orders have gotten in the way, and I have owls and love birds to make! Hoping to do one of the moors later in the week! I'll be sure to keep you posted! Isn't it cute? 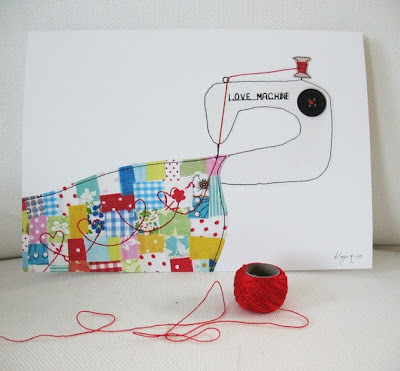 Some of you may recognise the image from Scandinavian Stitches by Kajsa Wikman. When I saw it was available as an art print in her Etsy shop, I bought one immediately and now it's framed in my studio. I love it! Kajsa also writes a blog - go check it out! Have a fab weekend y'all! Yesterday was one of those rare days when all orders (trade and private) had been taken care of, so with my youngest boy at pre-school all day, I sat at a clear desk and started on a new collage. This one is only half the size of the ones I've done before (A4 size), and I was pleasantly surprised how quickly I finished it! I find it so therapeutic making these, almost like doing a jigsaw puzzle. Here's a couple of details: in this one I'm liking the floral piece in the sea - can you see it? I like just giving an impression of something (eg these flowers here). No labour-intensive detailing for me, thank you very much!! I'm hoping to do a few more of these. It's not so daunting starting something on a smaller scale. I could do some really small ones - this would work quite well, I reckon. I think I even prefer it to the bigger picture! What do you think? I've got a pitch booked at the Royal Cornwall Show in June, thought I'd frame some stitchings and see if I can sell any! I'm going to frame the top 3 together, ie in a triple frame. On the subject of birds, look as this fantastic book I bought a couple of weeks ago. Before I go, I must tell you that another Homespun Fair is fast approaching! It's taking place at Portscatho on Easter Monday (April 25th) and promises to be a wonderful event. You can find more details on the Homespun blog.